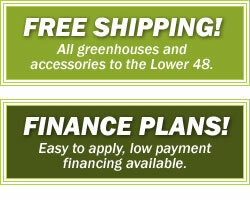 To help you make buying a greenhouse easier on your wallet, Grandio Greenhouses is proud to offer our new Layaway program. Please call us at 1-866-448-8231 to begin a layaway order. If you've already made a user account in the shopping cart make sure to tell us so we can associate your new order with your existing account. No fees: We don't charge any fees to start a layaway order. No interest: Get 12 months interest free on your whole order. Down payment: Before you start your layaway order, we will ask for a minimum of 10% down payment of your total purchase price. Limitations: Some items may not be available for a layaway order. Please contact us to verify and begin the plan. Shipping: Orders will not be shipped until payed in full. User account: To make sure we have your contact information, we require a registered user account to use our layaway program. If you don't already have one, we can create one for you when you place your order. You can make payments over the phone anytime during the 12 months following your order date. Just call us at 1-866-448-8231, 9am-5pm MST Monday-Friday and let us know you'd like to make a payment on your layaway order. Cancellation fees: 15% of total amount paid if canceled within 12 months. After 12 months there are no refunds. If for some reason the layaway is not paid in full after the 12 month period and the customer wishes to continue the layaway, we may extend the period for up to 6 months if requested by the customer. Please note that the purchase and all payments become non-refundable at that time. Feel free to contact us with any questions you might have, we're happy to help. We're available Monday-Friday 9am-5pm MST. Or use our contact form and mention the layaway program.